A free copy of this cookbook will be was given away as part of this post for one lucky winner (US residents only). A winner has now been picked and the free copy was supplied by the folks over at Behind the Food Carts. I received no monetary compensation for this post. All opinions expressed are mine. This Spicy Pork Ramen Noodles is an adaptation of the Loco Moco Mazemen from Food Truck Road Trip – A Cookbook, and is a restaurant quality dish bursting with incredible flavour! It’s a spicy pork Ramen noodles topped with a Furikake seasoned soft boiled egg that will gourmet up your Ramen noodles effortlessly! If there ever were such a thing called Cookbooks (Cookbookholics?) Anonymous, I should be at the front of the line waiting to sign up. I got so many, I’ve long since lost count. There are a few gathering dust on a shelf, but most have been dogeared to the spine. Another thing about me that I haven’t talked about much on this blog is that I’m obsessed with food trucks. I find the whole thing incredibly fascinating. I mean it’s a 100 sq ft kitchen on wheels, rolling through streets sometimes from city to city, cooking up some of the most inventive and tasty stuff on earth! Whenever I go on trips/vacations, I make it a point to eat as much as I can from food trucks. And for a long time, I have flirted with the idea of actually owning and operating one in spite of knowing how grueling that job can be. Maybe one day. Maybe. 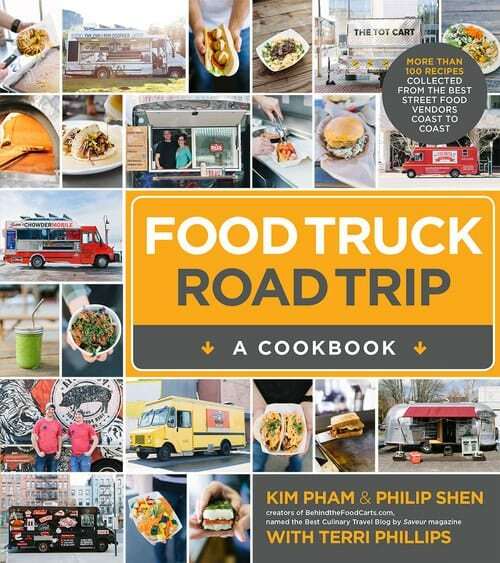 So you can imagine how excited I was to get my hands on this – Food Truck Road Trip – A Cookbook! In this book, you will find over 100 amazing, diverse and creative recipes from some of the best food truck vendors in the US! And if you think it’s going to be all deep fried, same ol’ same ol’ stuff, boy you’re in for a surprise. This stuff is legit. Legit good! The recipes in this book have been compiled by Kim Pham, Philip Shen and Terri Phillips. Kim and Philip are also the creators behind the amazing blog – Behind the Food Carts. What I found really engaging about this book is how it pulls back the curtain and lets you take a peek into the fascinating world of food trucks and their proprietors. Each recipe is accompanied by photographs and brief stories about the wonderful people behind those recipes, their passion for their craft and of course the food itself and how and why those recipes work. It will inspire you and make you want to try them. This is definitely one of my favourites and I’ve already made a bunch of these recipes. Here’s one example – FoPo Cristo Sandwich (which I adapted a little in order to use what we had in our fridge – these recipes are quite versatile that way) by Sarah Arkwright, owner of The Egg Carton from Portland, OR. We had this for brunch on a weekend. 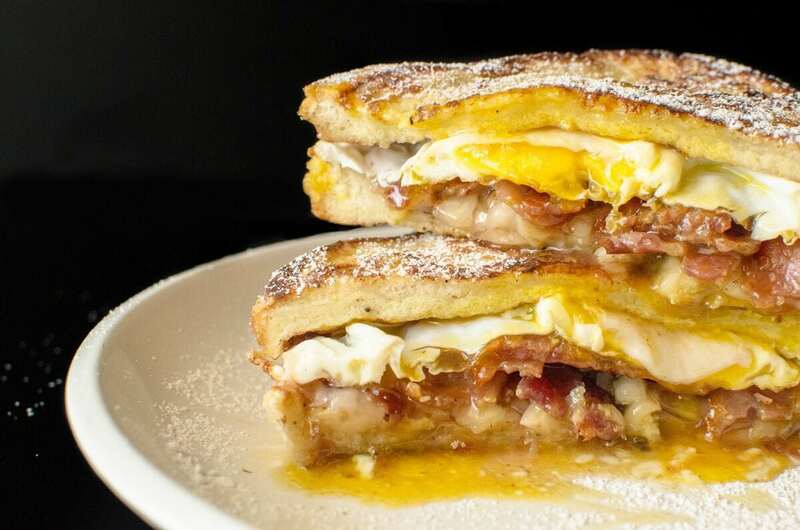 I’m not going to spoil it for you but let me just say that, it’s a French toast sandwich unlike any you’ve had before. Just look at that baby. and there’s more! I loved the book so much that I contacted Philip and asked him if we could arrange a giveaway so that one of my lucky readers (from the US) can win a free copy of this awesome book! And that folks, is why we are here today! 🙂 The giveaway has ended & a winner has been picked. PLUS, today I’m going to share with you a recipe that I adapted from this cookbook. 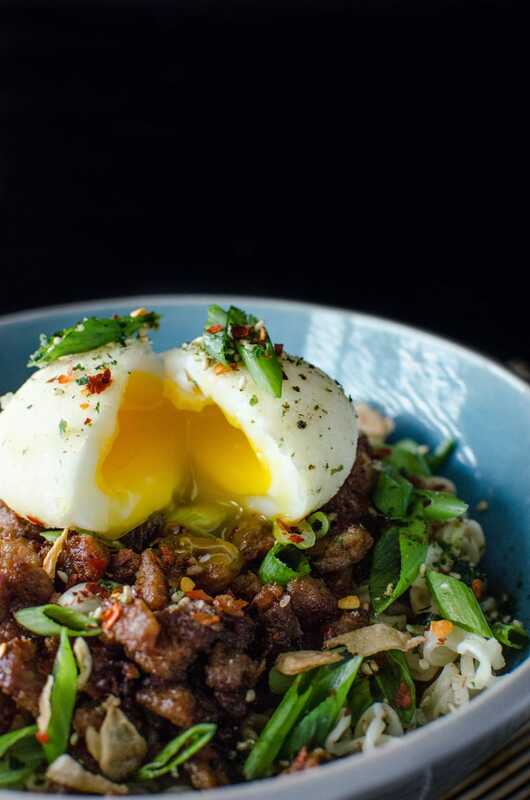 This is my version of the Loco Moco Mazemen by Kiki Aranita and Chris Vacca, owners of Poi Dog Philly from Philadelphia, PA. The recipe is described in the book as “a perfect marriage of Hawaii meets Japan”. 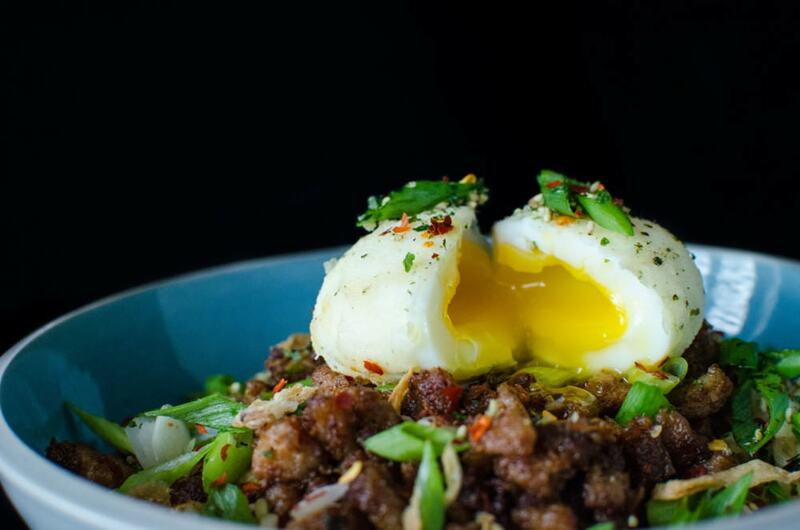 The Hawaiian Loco Moco features hamburger patty and fried egg while Mazemen is a Japanese brothless ramen. I made the original version with beef and miso as well, and absolutely loved it! 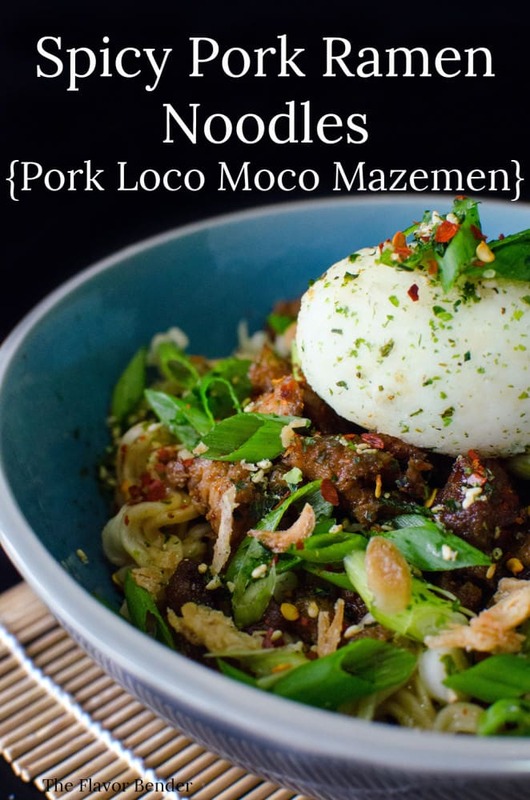 Here I’m sharing with you my adapted version (with my own spicy twist) – Pork Loco Moco Mazemen. That’s Spicy Pork Ramen Noodles topped with a Furikake soft boiled egg. Be prepared to be ‘mazed indeed! Finely chop the pork. Mix the chopped (or minced) pork with the rest of the ingredients of the marinade. Cover and let it marinate for at least 2 hours in the fridge. Bring 1 pot of water to a boil on high heat. Reduce the heat to a simmer and gently lower the eggs into the water (water level should be up to about an inch above the eggs). Increase the heat to medium and cover the pot and set the timer for 5 ½ minutes. Prepare an ice bath. When the timer goes off, drain the eggs and dunk them in the ice bath, until they cool. Gently peel the eggs under cool running water. The running water will help loosen the egg shell from the egg. Set aside until you have the Ramen broth ready. Optional step - to make the broth more flavourful (especially if you're using store bought). Combine the pork stock with the spring onions, ginger and garlic and simmer for about 30-40 minutes uncovered. Drain and reserve 2 cups of the stock. In a saucepan, heat the oil. Add the flour and whisk until you have a smooth slurry. Keep cooking till the flour starts to turn light brown in colour. Add 2 cups of the stock, along with the shoyu, mirin and chilli flakes to the flour mix. Whisk or mix continuously until it starts to thicken. Set aside. In a nonstick pan, heat a little oil and add the marinated pork meat. Stir fry for a few minutes until the pork pieces brown, and just start to become crispy. This can take 5-10 minutes depending on whether you will be using minced pork or finely chopped pork. Drain any excess oil and set aside, and wipe the nonstick pan to fry the egg. Optional step - if you'd like to season the egg with furikake. Heat a small amount of oil in the nonstick pan . Combine the cornflour and furikake in a small dish. Lightly cover the soft boiled egg in the egg white and carefully roll it in the cornflour/ furikake mix. Fry the eggs in the pan, a little on each side until they just start to brown. Set aside. Place cooked ramen noodles in four bowls. and pour gravy/sauce equally over the ramen noodles. 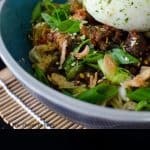 Top it with the pork, furikake egg, an extra sprinkling of furikake, fried shallots, and chopped spring onions. I wish I knew how to make this years ago, in my student life. Ramen was my good friend (still is, I haven’t forgotten you Ramen!). I’m the dry Ramen kind of girl while Mr. K is the soupy Ramen kind of guy. This, we both enjoyed, because it’s got the best of both worlds! I loved the original version with miso and beef, but I just had to make it with some pork and spice it up. The egg is the perfect addition that brings everything together. Furikake is such a delicious seasoning, I can’t believe that it’s been so long since I’ve had it in my house. It used to be a permanent resident in my apartment when I was a student, because I used to just sprinkle it on steamed rice all the time. The crispy fried pork is a little sweet, a little spicy with lots of crunch and still so juicy! 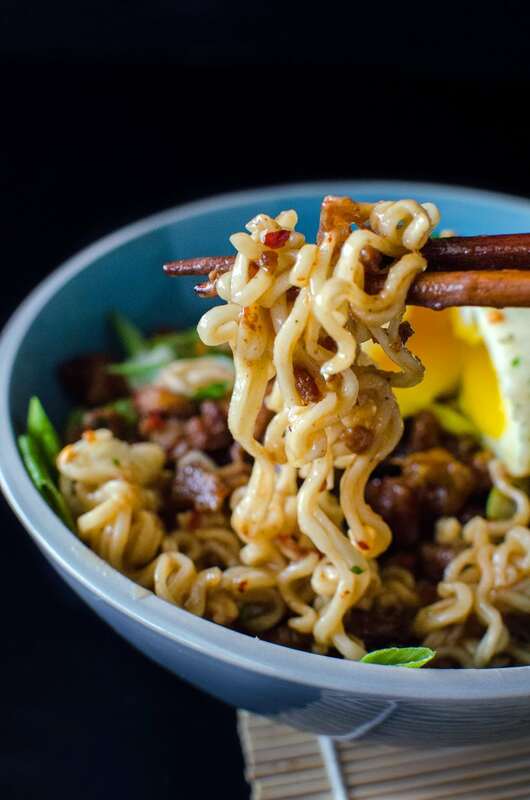 Once you mix everything together, biting into bits of juicy pork while you eat the delicious noodles is a wonderful surprise. The trick is to use a cut of pork that has a little fat in it as well. If you do use minced pork – try to avoid the lean meat, as it would be drier. If you want to find out how these guys make amazing restaurant-quality food with just a fraction of that space in their food trucks, this is the book you need. The recipes are also versatile, so that you can add a personal touch to them however you like. There are so many more recipes that I want to try, like the Spanish pork shoulder chili, vegan lemongrass fivespice seitan sandwich, garlic carne asada quesadilla, etc. etc. etc. I know you will too. So go ahead and enter the giveaway to win a free copy of this awesome cookbook! 🙂 & get your hands on the book too! This giveaway has now ended. This giveaway is open to US residents only. If you liked this recipe don’t forget to subscribe for new (and free) recipes and updates by entering your email address below or in the box on the side-bar (and get all these recipes delivered straight to your inbox), so you don’t miss out on a thing. You can find me on FACEBOOK, TWITTER, INSTAGRAM, PINTEREST and GOOGLE-PLUS too. I love food trucks and dream of owning one one day! I hope I win this one too! This looks like an amazing dish! Can’t wait to try it out soon. I live in central Wisconsin where there really aren’t any food trucks, but try to enjoy some whenever I travel. Would love to check out the cookbook and try some delicious new food! I had a pizza from a food truck that really surprised me and I would love to make tacos and burritos. Truffle Fries from The Flying Stove in Wichita, KS. Oh Boy!! This look amazing. I am a big fan of ramen noodles so I need to try this recipe soon. Pinning. Holy sheeeeeite girl. You’ve cooked that egg BRILLIANTLY!!! Kudos to you! I luuuurrrrrvvvveeee ramen! I have a ramen recipe on my blog that took a bloody 3 days to make! I like the borritos at the truck downtown. I think I’d try this recipe you posted, looks so good! I sure wish I lived in the US so I could enter into the draw! However I think I will look for this book online! I am also fascinated by food trucks 😀 This dish looks so yummy and easy to prepare! GAH. I love food trucks, and noodles with an egg on top are always amazing! My husband works at a company that often hires food trucks for their company events and it is sooooo fun to sample and try the different creative dishes that food trucks are famous for making: grilled cheese sandwiches stuffed with macaroni and cheese, tacos filled with bulgogi, vegan baos, etc.. Yumilicious!!! Thanks for this recipe, I hope I win the giveaway, whooooo-hoo! This is just beautiful Dini! 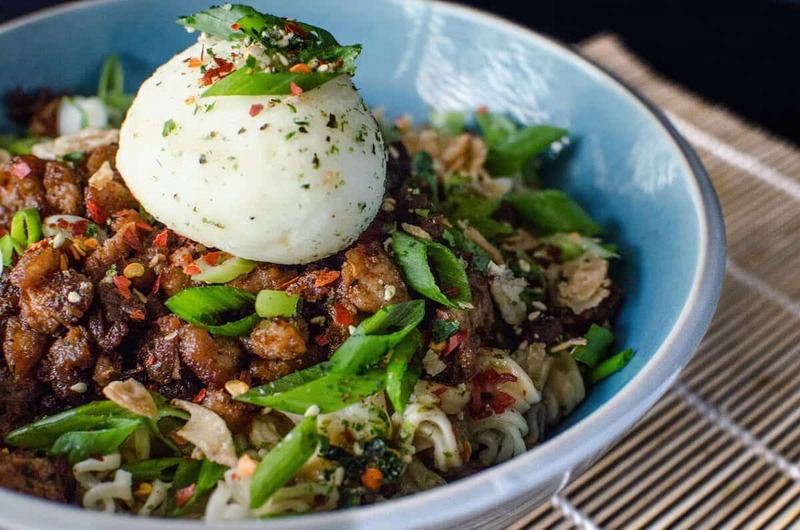 I love the idea of the sweet pork with a bit of spice and all those spicy noodles. Of course we can’t forget about that amazing egg! To Die For! Thank you Angie! 😀 I will make sure I have a Sushi burger ready especially for you!! From a Cookbookholics to another: what a recipe! can’t wait to make it! I think Kogi is definitely the best food truck. Not only it started the food truck revolution, their food was very inventive and delicious. If I win, I will need to check out some fusion food recipes. This ramen is totally irresistible! I love ramen. The broth sounds very flavorful with that perfectly poached egg. Oh my goodness!!! I agree, Ramen is so good! We always have at least a couple of packets for emergencies and it’s so fun to dress them up! This looks silly good! I want it. Boy does this look incredibly tasty! I had no idea that was an egg on top until I kept reading. Such a delicious combination of flavors going on! First of all, gorgeous photos!! I wish I could eat this dish right now!!! Looks Amazing!!!! Man this looks SO good! I love food trucks as well and it’s so fascinating how they come up with such amazing things in such tiny spaces. Thank you C! 😀 If your mouth was too full to ask questions – that is the best sign of good food!! hahaha!! I love experimenting with flavours too! Great minds think alike Kat!